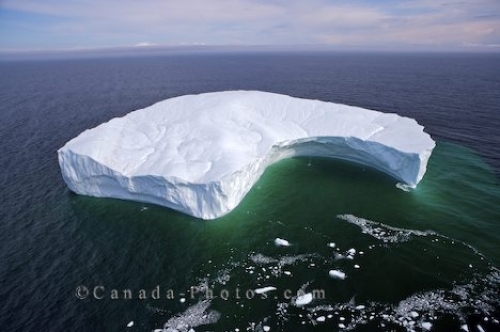 An aerial picture of an iceberg floating in the Strait of Belle Isle in Southern Labrador, Canada with chunks of ice breaking away. As icebergs melt, pieces of ice can be seen breaking off until the entire iceberg has disappeared in the vast waters of the Atlantic Ocean. Flying over this iceberg in the Strait of Belle Isle in Southern Labrador in Newfoundland Labrador gives one a fantastic aerial view of the ice breaking off of the iceberg. Aerial of ice breaking off a large iceberg in the Strait of Bell Isle in Southern Labrador in Newfoundland Labrador, Canada.